Laurel Snyder » Blog Archive » Ta-DAH!!! This entry was posted on Monday, January 10th, 2011 at 3:50 pm	and is filed under Blog. You can follow any responses to this entry through the RSS 2.0 feed. You can leave a response, or trackback from your own site. Congratulations! I eagerly await it! Such a charming cover. Very mysterious! The cover begs you to ask questions and see answers. Although we of course shouldn’t judge a book by its cover, I’m sure this cover will hook lots of readers in. It’s an absolutely gorgeous cover! You’ve got me really looking forward to this book. I LOVE it, Laurel! It’s eyecatching (no pun intended) and wonderful and implies magic all at the same time! It’s beautiful, Laurel! Very striking! Beautiful cover, Laurel — and very enticing, to this reader at least. Looking forward to reading it! Finally! I’ve been waiting for a book about magical bread boxes and Bruce Springsteen. Congratulations on the book and the cover! I love it! It reminds me a lot of the Andrew Clements covers – starting with Frindle, The School Story, and so on. 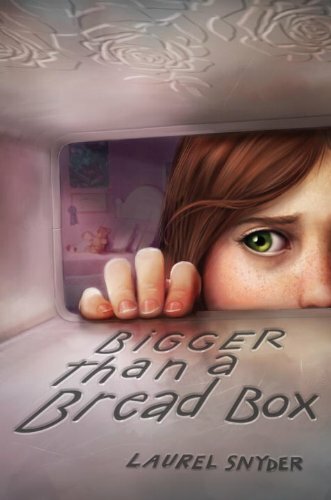 The pink, almost-purple of the room, and the inside of the bread box really makes her green eye stand out. I really like the bedroom detail in the background too. Thanks for sharing the story behind the story. Regarding cover: I’d pick it out of a crowd. Regarding the story: I can’t wait to read it, though I’m sure I’ll weep through it. My life was profoundly affected by my parents’ divorce even though they split up when I was 2 or 3. It was surviving the life after with all of its inherent complications and emotions… and *differentness*. Anyway. You were indeed brave to plumb those depths. I hate waiting… though I’m sure you hate it more. I LOVE It…look at that look of apprehension! Great title too…makes me want to figure out the mystery. Sorry it made you cry & so glad your mom was there to pat your head and bring you to the present day. Crikey! That is one pretty cover! I can’t wait to read it! Very intriguing cover, and the story is sure to be outside the box (ironically) as all your stories are! I don’t know why we don’t talk more! I’m dying. You’re like me except your book is out and mine is in my computer. You do know I am obsessed with Bruce Springsteen and that, piggy-backing on the phrase used by the above poster, MY life has been profoundly affected by him. Mazal tov!!! I’m soooooo proud and more than anything excited for you. This is voice is so sadly needed. Thank you Laurel! As Polli would say, Huzzah! Laurel, it is a truly magnificent cover…wow! I will be eager to read the book. I so worry about how a divorce of their parents will continue through the years to affect my children, especially my daughter who was thirteen at the time. I am so glad you have written this story. Congrats on the new book! The cover looks fantastic. It looks gorgeous. I can’t wait to read it! Laurel, it is mysterious and fantastic… and PERFECT! Congratulations! Jiminy crickets, it’s AMAZING. Utterly grab-inducing. I can’t wait to read the book. Sounds beautiful & captivating. thinking of you today with the ice down there in the news. we have a foot and a half of snow today and josephine is home with a fever, so we are cozied up. Cover looks good – but they should have gone with me. Thanks! I (of course) wish they had gone with you, but I like it a ton anyway. I really hope we can do a book together. Glad you’re cosied. Sorry about the fever! Great cover! Happy Birthday, again. I love it! It will make kids want to look in with the MC and see what she’s looking at. Congrats! And good point about Bruce Springsteen, too. Very nice! I will definitely look forward to this one, but it will be a long wait, since it’s not even on Follett’s site yet. And good luck with your poet hat. It’s a good time of year to get to be a grown up a little!